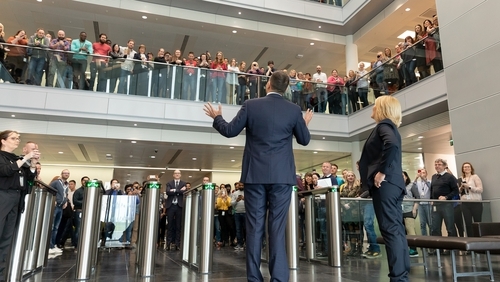 Taoiseach Leo Varadkar paid his first visit to the Apple campus in Cork today, where he met some of the company's 6,000 employees in Ireland and inspected the latest innovations in Apple Technology. The campus, at Hollyhill on the northern outskirts of the city, has undergone a recent expansion with a new building adding space for a further 1,400 employees. Almost €220m has been invested there since 2012. Mr Varadkar was met at the campus by Apple's Vice-President of European Operations, Cathy Kearney, and was shown some of the education initiatives supported by Apple in Cork during a tour of the facility. He met 100 transition year students from the local St Vincent's Secondary School and from Coláiste an Spioraid Naoimh. In addition, students from Terence MacSwiney College have been benefiting from the work of 40 Apple employees who, since 2016, have been volunteering to teach the students a coding curriculum to help them to communicate ideas through drawing, music, video and photography. Apple's transition year programme was launched in February and, by the end of next month, almost 1,000 students from 20 local schools will have taken part. Mr Varadkar praised the contribution that Apple makes both to the economy and to the community in Cork, noting that Apple contributed around €250m in payroll payments to the local economy annually. Terence MacSwiney College Principal Phil O'Flynn said: "We have a lot of students who have the odds stacked against them. But the Apple volunteering programme has helped nurture them, and we've discovered talents that we never knew they had. "You have to create hope, no matter what context you work in. Sometimes you need a bit of help with that, and that's what this programme does - it lifts the school." Apple's Cathy Kearney said: "I'm incredibly proud that we've played such an active role in the Cork community for nearly 40 years. "Supporting education is one of Apple's core values and through our transition year visits we offer schools an exciting learning experience and an insight into careers at Apple." The Apple campus in Cork is powered by 100% renewable energy. There are also a range of environmental features, from solar thermal panels to smart lighting and rainwater harvesting from the roof. The campus is also certified zero waste to landfill through initiatives such as the re-use of cooking oil from the restaurants to produce biodiesel.